Share with the world that your day does not start until the coffee is in front of you. That's how it is at Dali Decals, anyway! Our wall decals are ideal for bedrooms, offices, living rooms, entryways, classrooms, even your car, bathtub or glass shower doors! 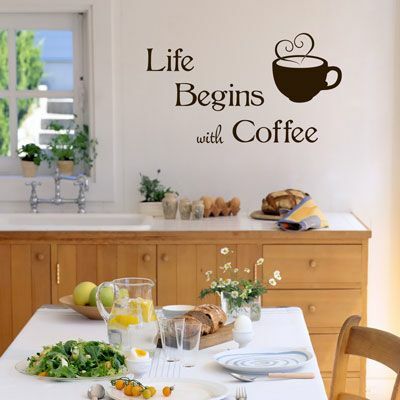 This Life begins with Coffee decal is shown here in our Medium size, which measures 40 inches wide by 22 inches high. Small size measures 22 inches wide by 12 inches high. 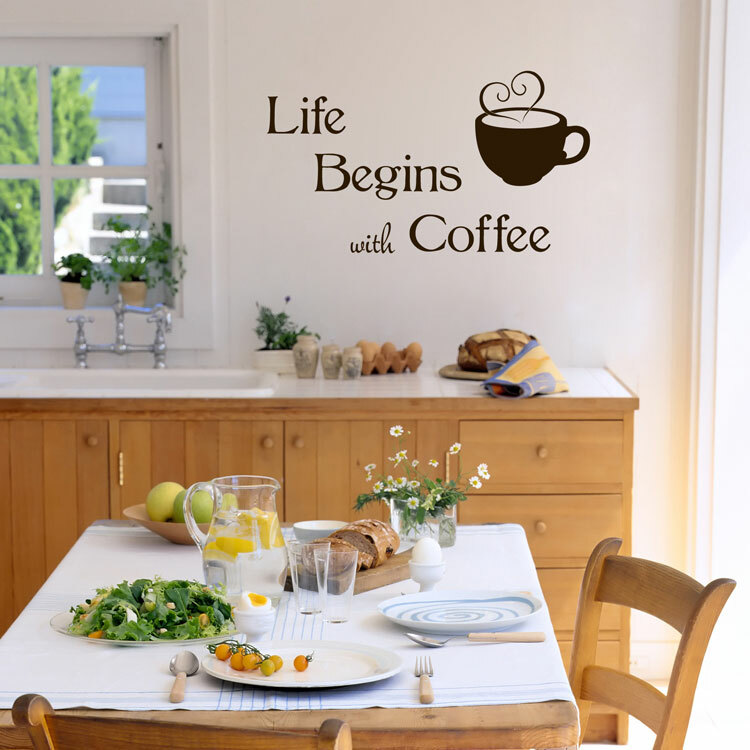 Both sizes of our Life Begins with Coffee decal come in one piece, ready to apply, but can be cut apart if you would like to separate the lines of text to create your own look. I had the typical art pieces on my study wall, but wasnt happy with the look. I googled tree decals and these were absolutely the best price and the most unique. Other web sites were child like and I almost expected the cow to jump over the moon. My tree is sophisticated, unexpected and whimsical in an otherwise ordinary study. Two 60 plus year olds put up our tree in a little over an hour with out injury or argument. We will be back! Hello, I just wanted to pass along a sincere "thank you" for your website. As a budding web designer, I found your site to be extremely easy to navigate, full of helpful information, and most importantly, quick to load! Every click of my mouse was instantly rewarded with colorful images, easy-to-find menus, lots of great links, and did I mention FAST! I'm going to bookmark this site to revisit over and over. Thanks for making a user-friendly site (and a great product to sell on it!). I'm planning to make a purchase and can't wait to see your check out process in action. Keep up the great work! Overall I'm EXTREMELY satisfied by the decals I ordered from Dali. We have textured walls, and it was rather difficult getting the decals to stick, but after applying a clear coat sealant over the decals, we haven't had any peel off. The decals look AMAZING and the colors are spot-on! I will definitely be using Dali again, and I'd also recommend others to use them as well! Thanks Dali! !